After my initial return to clay I began making a few pinch pots. I knew I wanted to do something more, but what? I try not to force these ideas, this creative process of mine, but let them come to me when they do - and it usually does when I least expect it! And it was no different this time either. In the early hours of the morning, I’m guessing around 4am (too early to get up but late enough for my mind to think it’s getting close), I had a strong image of a conical-shaped cat dressed in a suit and tie, looking very professional. What was that? !, I thought. Okay, remember it - sketch it, paint it, maybe it will turn into something. 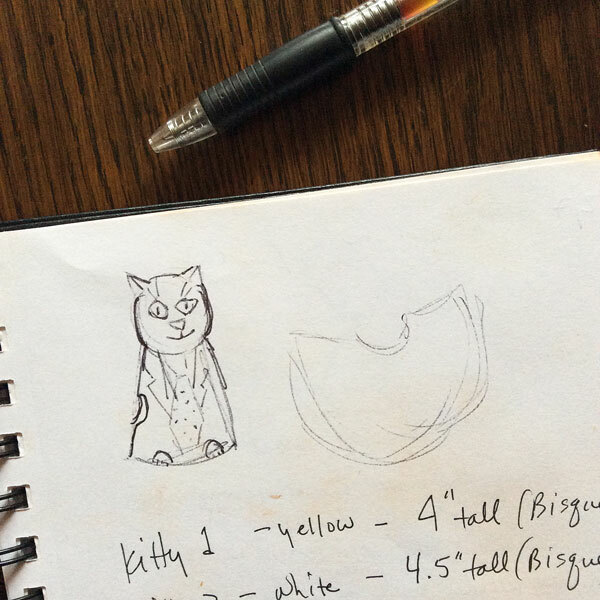 My initial cat image sketch from a dream. 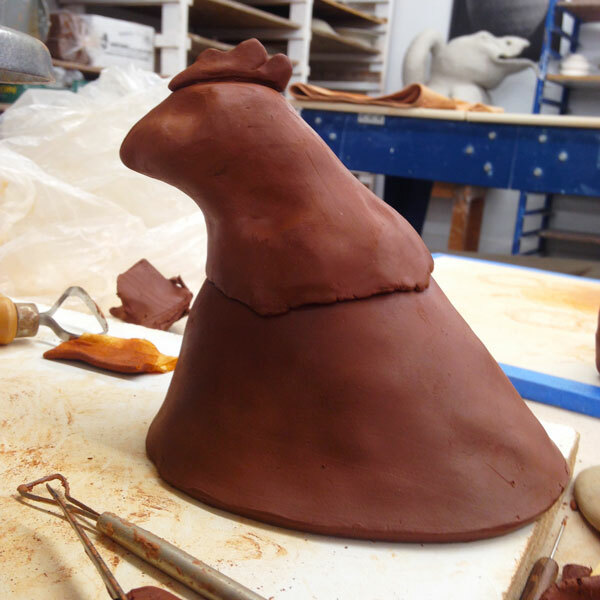 It was the morning of my 2nd clay class, January 31st. I was just wrapping up a challenge to paint a pattern everyday for 31 days, so my mind wasn’t on sketching out an image I had from a dream-state. I got to class, still not knowing what was next, then I remembered the cat. Hmmm. I made a quick sketch. Okay, now what? How would I go about building this guy? Then the half circle idea came to me (see image above). Make a skirt of sorts, then build upward. And that’s what I did, I rolled out a slab of red clay, let it stiffen for an hour or two (made another pinch pot! ), cut out the half circle, and made the lower portion of the cat. Next I shaped a cat’s head, hollowed it out, and placed it on top. Then made another. The first 2 cats in their leather-hard stage. When they were a bit more stiff, more like the leather of a saddle, I dipped them in white slip before applying underglazes. The cats getting decorated. First comes the white slip, then the underglazes are applied. I decided while making the first cat that I didn’t want it to wear a suit. I didn’t want to cover up what was inside this creature, I wanted to paint on the outside its inner essence, its spirit. Cats can be curious, playful, aloof, regal, independent, intuitive, and courageous creatures. This was going to be a fun surface design challenge! As I was waiting for my two cats, Ginger and Calypso, to go through the firing process, I began on my next animal of interest: a chicken! Chickens crack me up. They are so amusing to watch; each has their own personality, their own set of quirky moves and looks. First I made a sketch, but deviated from it as the clay wanted to do something entirely different. A few sketches along with the first chicken sculpture. Okay, I was really enjoying these animals. I had to make another chicken - of course! The second chicken freshly created. Chickens are another curious critter. They are also aware of their surroundings, have a tendency to shy away from sudden moves, and will raise a ruckus when provoked. If you have a few backyard chickens yourself you’ll know how entertaining they are too. The decorative elements on these chickens evoke their nature, as you can see with Dot and Jenny (below). 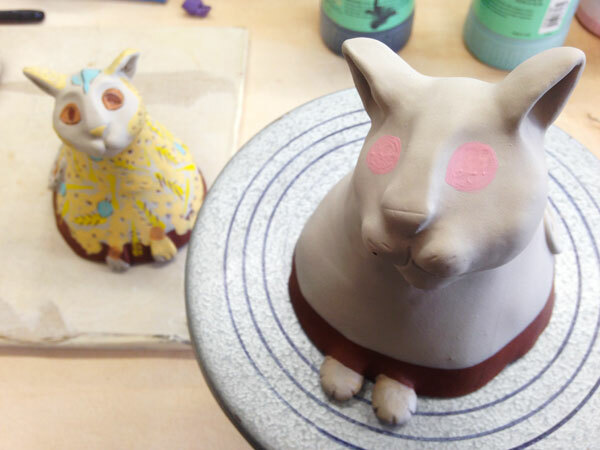 Drying on the shelf, Dot (L) and Jenny (R) after being painted with underglazes. When they all came out of the final firing I was tickled pink! Each one was unique and true to its inner self. Thus my Spirit Animal series began. 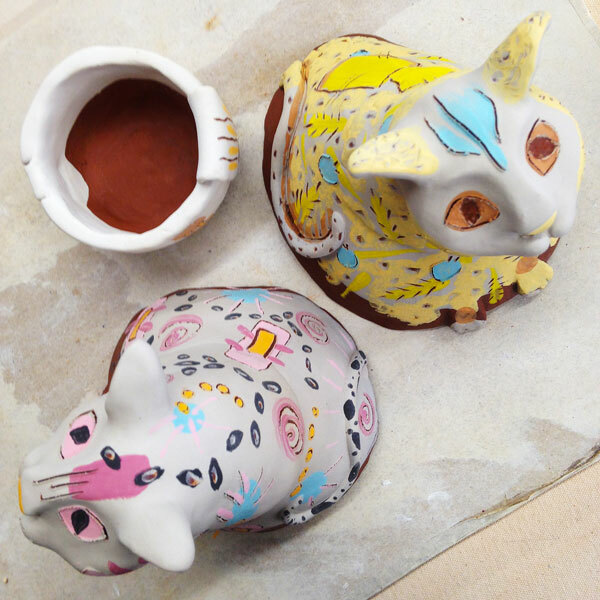 Meet Ginger, Calypso, Jenny, and Dot - the first four clay sculptures from my Spirit Animal series. Each animal is hand-built from red clay and decorated with underglazes over a white slip to bring out their true essence, their spirit.